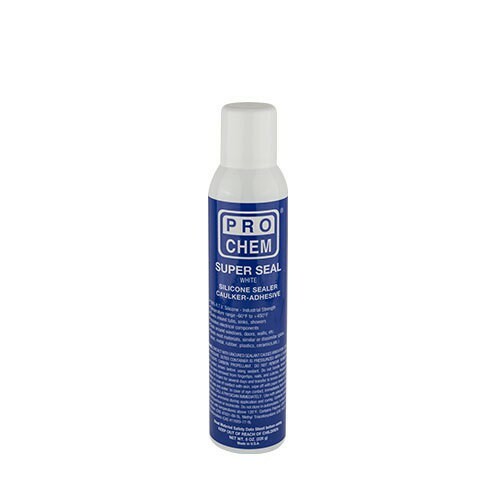 Super Seal | Pro Chem, Inc.
SUPER SEAL, 100% RTV silicone adhesive/sealant, is a gel-like, one-component material that cures to a tough, rubbery solid when exposed to moisture in the air. SUPER SEAL is ideal for use wherever a strong, permanently elastic, weatherproof seal is needed. It has excellent adhesion characteristics, high chemical resistance and will not sag or shrink due to severe temperature changes. SUPER SEAL offers good resistance to most solvents and oils, and organic and inorganic chemicals. Ideal for gasket making, sealing, caulking, and bonding. Clean and dry surface. Remove oil, grease, dirt and dust from surface. Hold nozzle at 45° angle and apply a continuous bead of 1/16” to 1/8” in any direction. Sealant normally “skins over” in 5 minutes and dries tack free to the touch in one hour. If spreading or working material is required, do immediately after applying. Paper towels can be used to remove excess. Sealant cures and bonds fully in 24 hours and maximum strength is achieved in 7 days. Sealant is easily trimmed with a sharp tool. Do not destroy bond by undercutting. Note: Not resistant to gasoline. Do not use for head gaskets.